We know but we still doing it! “If into the security recordings you go… only pain will you find”. Yoda from Star Wars – Revenge of the Sith. Author RamiPosted on July 8, 2018 Categories A mon avisTags Thoughts.., حديث النفس, خواطرLeave a comment on We know but we still doing it! Everyone in the world agrees that we are different, brothers raised in the same family and under the same roof are different, twin that grow up on the same time in the same womb are different. Two tress are different even if they are coming from the same fruit’s seeds. With my new yoga experience I learned that there are even differences in the same body! For example, my left leg is different than the right one, my right shoulder is different than the left one! How much I can do with my right arm is different than the left one! But with all these differences they shape one body that live in peace, they work together in harmony to help doing everything I ask. I never saw my left foot refuse to work with my right one because it has different size or less flexibility. I never felt that my right eyes asking my left one to leave my body because is less stronger. On the opposite, if my left eye is less stronger, my right one will do more effort to cover this gap. When my left leg get tired my body lean to my stronger right leg to give more support. They work as a whole to make me what I am now. I wonder why people in our society don’t look into themselves and learn from their bodies that being different is not something bad. It is part of the beauty of our life and with our differences we fill the gaps between each others. We can live in peace and harmony, we can support each other in one society even if we are different exactly like my left leg support the different right leg in the same body! Today I discovered that I am completely prisoner of the time! Today I went to my Yoga class a little bit earlier and before the class started I noticed that I am not wearing my Fitbit watch. For a moment I had a panic attack but then I remembered that I connected to my PC at work to be recharged and I forgot to take it back again. I told myself, tomorrow I will get it, that’s not an issue. I started to prepare my yoga mat, and I sat on my cushion waiting for the class to start, unconsciously after few moments I looked at my arm to see the time, but the watch was not there. I felt irritated because I felt that I don’t know what’s the time now! How long I have to wait until the class to start?! I looked around to see if there is a clock but nothing was there, just empty walls. I said to myself; close your eyes Rami and try to clear your head from the daily thoughts. But this idea of losing the track of time kept coming back again. I had a discomfort feelings, I am losing the track of the time! I am getting lost!! The class started, I tried to focus more on the instructions but from time to time, something jump in my head, asking what’s the time now?! I had to fight this feelings couple of times until I won. I completely let the time go and I lost the track of time. The only thing that I was focusing on my breathes and how to put my self in the posture. I finished the class, and I don’t know what is the time now, my head is clear, I don’t care if it is late or it is early. I arrived at home and once I entered my living room I noticed the time and I said to myself. It felt like if I was away for a very long time! We are prisoner of the time (at least me), sometimes we lose the joy of a moment because we are afraid that it will end soon. We keep looking into our watches/mobiles or clocks to know our location in time. We lost the sense of time because we keep tracking of it, we are afraid to be left alone without knowing the time because we are afraid to be by ourselves so we don’t face ourselves for a longer period. What I learned today is to set myself free from my time’s prison, to enjoy the moment and face myself without a fear. بتكون فاتح الفيسبوك بروح بطلعك صاحبك وبرسالة وبكتبلك (rhd3as sads5 dads9) وبعدها ابتسامة؟؟؟ طبعا مخي ببطل يجمع شو هاد بالزبط بقعد افك الشفرة! (اه انا قاصدكم انتوا اللي بتكتبولي هيك) بتحكيله او بتحكيلها فيك تكتب عربي، بقلك لا هاي اسرع..مش فاهم كيف اسرع كابس الكبسة سواء حرف عربي او لاتيني… المهم بدك تكتب بأحرف لاتيني بتكب لغة افهمها يا انجليزي يا فرنسي غير هيك… غيِّر للعربي. الشي الوحيد اللي بيخطر على بالك وانت بتبسم وبتحكي لحالك… يا ريت قومي يعلمون…. ملاحظه: مش معنا هاد الحكي اني ملاك ما بعمل شغلات وما بكتب بلغات تانية! لما بدي اكتب شي بلغة تانية بكون موجه الموضوع للكل مش بس لمجتمعنا… هون كلهم ١٦ مليون واحد في العالم وكل شي عندهم معمول بلغتهم حتى اجهزتهم الخلوية بتكون بلغتهم… ما صاروا متخلفين ولا ناقصهم شي بالعكس من دول العالم الاول!! السلام عليكم، مجمع الشمال؟ سأل صاحب سيارة الأجرة التي استوقفها. اه تفضل؛ بس حط الشنطة ورا. اجابه السائق. انشاء الله؛ اجابه وهو يحاول تذكر كم سائق اجره سأله نفس السؤال. وين نازل على خير؟ يسأل السائق مجددا. على نابلس ياحجّ. اجابه وهو يتفقد كومة الأوراق الثبوتية لعله نسي شيئا منها. الله يّسِّر امرك؛ اخدت معك دُّخان؟ سأل السائق مرة اخرى. لا والله يا حجّ ماأخدت. ما بدخِّن. خُد معك، بتبيعهم هناك بطِّلع حق نزلتك، أنا عملت هيك لما نزلت على الصيف. انت بتعرف. كم بتربح بالكروز!لا ياحجّ ، بشتري من السوق الحُرّة على الجسر، في محاولة لإنهاء الحِوار. لا ما بدخن وما في حد عندنا في البيت بدخن! لا ياخالتي ما بشيل معي، أجابها وهو يبتسم. بعينك الله يا خالتي بس الاتنين هذول ولو بدّي اغلبك. معلش ياخالتي، مستعجل وما بدّي استنى حد وانا طالع. ماشي ياخالتي، شكرًا ألك. جوابته وعلى وجهها نظرة حزن لعل قلبه يرق وَيأخذ معه علبتا الدُّخان. المكان هاظ لحد؟ سأله احد المسافرين عن المقعد الخالي بجانبه في الباص المُتجه إلى أريحا. لا مش لحد تفضل. اجابه وهو بتنفس الصعداء بإن رحلته اوشكت على النهاية. الجسر اليوم فاظي وما غلّبوا حد في الجمارك، لو كنت عارف كان جيبت معي كمان دُّخان! يحاول المسافر كسر الجمود والدخول في حديث. اه اليوم مشيت الأمور بسرعه، الحمدالله. وهو يأمل ان يدعه لوحده. شايف الباص هاظ، بتحداك انه تلاقي راكب مش شايل معه دُّخان، قالها المسافر وهو يضحك وفي صوته نبرة تحدي. خطر على باله ان يجيبه “أنا لا أحمل دُّخان ” ولكن منع نفسه لان ذلك سيدخله في سين وجيم ولماذا وجميع علامات الاستفهام. فأجابه اختصارا للحديث “معك حق”. في تلك اللحظة خطر في باله شيء وحيد وهو كيف اختزلت احلام شعب بعلبة دُّخان يجلبها معه عبر الحدود!! It was end of 90s when the whole Internet was orbiting around Internet Explorer, people started to forget what is Internet. There were not too many choices left. Internet is becoming Internet Explorer. My first love is now in the ICU for a long time, many tried to revive it but all the vital signs are showing that the end is getting soon and saving it is beyond anyone. 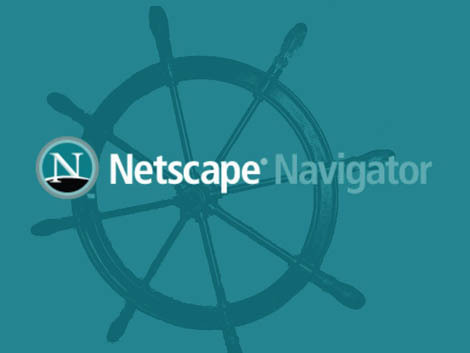 I have to deal with the fact that Netscape is dying and it is taking its last breathe. I am still refusing to go out with Internet Explorer, simply because I don’t want to see the virtual world only from its own eyes. I want to shape my own world and control it by myself. I started to look for alternatives, I went out with opera couple of times, it was pretty, flexible has lots of characteristics that attracted me. But it was too complicated to deal with, many things that always made me confused. After struggling few times, we decided to break up. I tried to go out with other browsers but most of them they had the same personality of Internet explorer but they were having different dress and make up. I was looking for the one that will win my heart and the one that I should give my support. The one that I will be proud of when others see us together.